In the fall of 2015, I wrote an article for the Hotline about Cercospora leaf mold of tomato since this disease had been observed twice in the 2015 season. I wrote that Cercospora leaf mold was normally a subtropical disease. 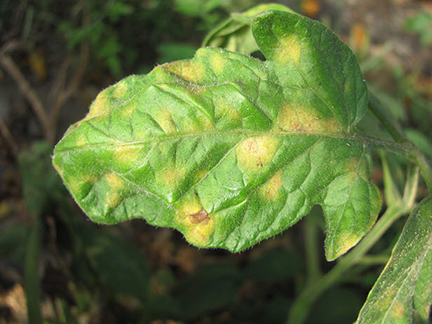 There have been several observations of Cercospora leaf mold on tomato in Indiana this year. I’m still not certain of the importance of this disease, but this article will compare Cercospora leaf mold and leaf mold of tomato. Leaf mold of tomato is caused by Passalora fulva and is common in Indiana, especially in high tunnels where the high relative humidity favors this disease. Cercospora leaf mold is caused by Pseudocercospora fuligena and is more common in the warm, humid climate of the tropics or subtropics than in the Midwest. Both diseases cause chlorotic (yellow) lesions which are visible on the upper side of the leaf. 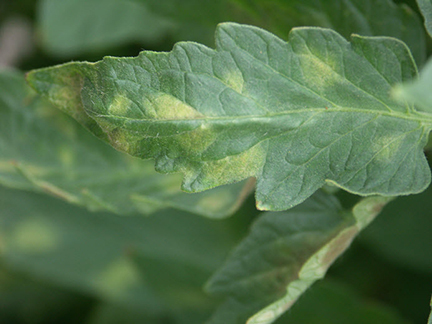 The chlorotic area caused by Cercospora leaf mold is more of a mustard yellow than that caused by P. fulva leaf mold in which the lesions are a brighter yellow (see Figures 1 and 2). Some literature suggests that P. fulva causes an olive-green growth only on the underside of tomato leaves. However, I have observed a green mold on both sides of leaves affected by leaf mold, in severe cases. Cercospora leaf mold can normally be differentiated from P. fulva leaf mold because the former is caused by a black fungus that grows primarily on the underside of the leaf (see Figures 3 and 4). Literature suggests that Cercospora leaf mold can occur on stems, however, I have never observed this. Leaf mold caused by P. fulva occurs only on leaves. Neither disease causes lesions on fruit. Figure 1: Cercospora leaf mold symptoms on the upper leaf surface. Note distinct chlorotic lesions. 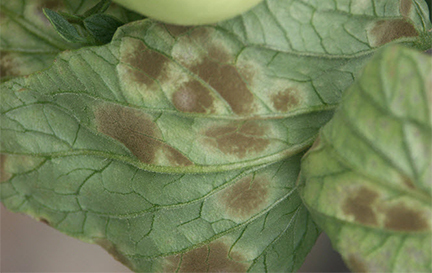 Figure 2: Lesions of leaf mold caused by P. fulva on tomato. Note indistinct chlorosis. 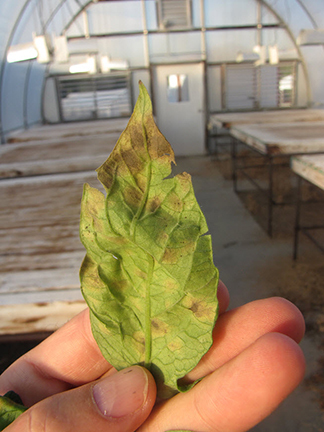 Figure 3: Underside of tomato leaf with Cercospora leaf mold. Note dark fungal growth. Figure 4: Underside of leaf with symptoms of leaf mold caused by P. fulva. Note olive-green fuzz of fungal growth. Both pathogens are reported to overwinter in soil. The reason why leaf mold caused by P. fulva is more common in Indiana than Cercospora leaf mold caused by P. fuligena may be that the optimum temperature for leaf mold is 71° to 75° F, while the optimum for Cercospora leaf mold is 82° F. Both diseases may be managed by sanitation. Clean out high tunnel tomatoes between crops. A floor covering that prevents infected leaves from entering the soil will help lessen disease severity. In the field, practice crop rotation and till under the crop as soon as the last fruit is picked. Varieties with partial or complete resistance exist for both diseases. Ask your seed representative. Fungicides which control P. fulva leaf mold should help to lessen disease severity in P. fuligena Cercospora leaf mold. Products that have been effective for leaf mold include: products with the active ingredient mancozeb (e.g., Dithane®, Manzate®, Penncozeb®), Inspire Super®, Tanos® and Quadris top®. See The Midwest Vegetable Production Guide for Commercial Growers 2019 more information. Be certain to watch the pre-harvest intervals. My experience with leaf mold has been that 2 to 3 applications of a fungicide once symptoms are observed should be enough to manage the disease. Fungicide applications can be stopped, in most cases, once harvest has started. If symptoms don’t show up until harvest has started, the disease will probably not become severe enough to reduce yields or fruit quality of determinate tomato plants. Always be sure to choose a fungicide labeled for greenhouse use if necessary. And always read the label.